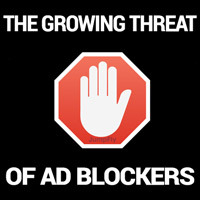 There’s no denying the fact that more and more people are using ad blocking software these days, and this trend only promises to get stronger in the coming years. Recent estimates indicate that 40% of the world’s internet users have installed some kind of ad blocking software, which is up from just 28% in mid-2015 (Newsweek, 2016). In the U.S., an estimated 45 million internet users were using ad blockers as of Q2 2015, and this figure represents a 48% increase compared to the previous year (NY Post, 2016). One of the options available to digital marketers is to directly address the issue by asking users to uninstall ad blocking software when it is detected. This approach can be effective because it gives the user control over the situation, which will create a better user experience and increase consumer satisfaction. However, the obvious drawback is the fact that many users will continue to block ads even when they’re politely asked to stop. The resulting loss in revenue can add up quickly, and this caveat is something that most businesses/websites/advertisers cannot afford to ignore. Globally in 2015, internet publishers lost $21 billion in revenue due to ad blocking, so many marketers favor other approaches that offer less risk when it comes to losing ad revenue. This strategy involves the use of marketing software that allows advertisers to show ads even when ad blockers are being used. This option will generate more ad revenue than the direct messaging approach a large majority of the time, so it’s no surprise that circumvention has become a very popular strategy among digital marketers in recent years. The promise of more revenue is very attractive, but it doesn’t come without a cost. By showing ads to people who have already actively decided to install ad blocking software, users may feel deceived or ignored by a business/website/advertiser. This reaction will definitely have a negative impact on user experience, and ultimately cause lower returns when it comes to sales, leads, visits, likes, or any other marketing objective an advertiser might have. A third option is to block the content that users are trying to access unless they agree to turn off or uninstall their ad blocking software. This strategy represents the middle of the road compared to the two previous strategies, and initial tests suggest that it can be successful: Forbes reported a 42.3% success rate during a recent experiment with content blocking (Forbes, 2016). Content blocking offers less risk when it comes to lost revenue because ads will still show to some users, and it should have less of a negative impact on user experience compared to circumvention. This happy medium sounds great on paper, but if only a fraction of advertisers and publishers choose to employ this method, it will likely prove itself to be ineffective. If a user can easily access the content they’re looking for somewhere else, content blocking will simply lead to higher bounce rates and less engagement with the business/website/app doing the blocking. On the other hand, if enough advertisers and publishers use this strategy alongside one another, people will be more inclined to disable ad blockers in order to access the content they’re looking for. Every situation is unique, and each advertiser will need to find the solution that works best for them, but the three strategies outlined above are certainly a good place to start. Moving forward, these strategies will likely play an important role for any digital advertisers who hope to combat the inevitable growth of ad blocking. The bottom line is clear: ad blockers are here to stay, and they do represent a major challenge to the world of digital advertising. Nevertheless, timely innovation and adaptation can offer digital marketers across the globe the opportunity to survive and thrive in this rapidly evolving environment. Given the ever-changing nature of digital marketing, 2015 is sure to bring a number of new features and enhancements to the world of PPC advertising. One of the driving forces behind this ongoing evolution of PPC is the growing need for accurate, reliable data that provides better insights into the true impact of digital ad campaigns. People are constantly connected in today’s multi-device world, which makes it even more important for a business to understand how their online marketing efforts influence consumer interaction once potential customers are offline. Recent studies indicate that 65-70% of consumers have visited a store after seeing a local search ad online. Furthermore, 68% of U.S. internet users were likely to research a product online and then purchase it at a physical store during this past holiday season. This combination of online and offline shopping has forced digital marketers to reconsider performance and ROI measurement when it comes to advertising online. Consumers might be inclined to visit a store and make a purchase after seeing ads from certain campaigns or on certain devices, and ignoring these purchases could cause a business to drastically underestimate the power and influence of their digital advertising campaigns. During the past year, Google has steadily improved cross-device and offline conversion tracking in an effort to eliminate the disconnection between PPC ad clicks and in-store visits. Over the next few weeks, they plan to start offering eligible businesses throughout the U.S their latest enhancement to conversion tracking: store visit conversions. This new metric will represent the estimated number of store visits that occur after a visitor sees a PPC ad online, and the data it will provide should make the offline and multi-device conversion estimates in AdWords even more powerful and accurate. Knowing what campaigns, ad types and devices drive people to visit a store will ultimately allow businesses to make better decisions regarding the direction and scope of their digital advertising. Have a Google My Business account that is linked to their Google AdWords account. Set up location extensions that use the listing(s) from their My Business account. 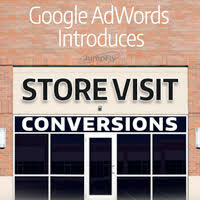 Consistently receive a large number of ad clicks and store visits. Have multiple physical retail locations in the U.S. If your business meets these requirements, store visit data will be available at the campaign level without any additional set up required. Google doesn’t specify what they consider a “large number of ad clicks or store visits”, nor do they give specifics regarding the number of physical locations a business must have in order to qualify. Regardless, advertisers should keep an eye out for this new conversion data in the coming weeks if their business meets the above requirements. By giving us a more complete representation of the impact that PPC advertising can have on a business, this new conversion metric should provide some powerful insights that will become more important to digital marketers as we move into 2015. The new “Device Preference” option allows advertisers to show their extensions on mobile devices more often if that strategy aligns with their advertising goals. This can be particularly effective for call extensions, as well as sitelink extensions that lead to mobile-optimized landing pages. Upgraded call and sitelink extensions can now be scheduled to show during specific dates, days of the week, or even times of the day. This allows advertisers to align their ad extension schedule with business hours or special events, such as a sale or promotion. Sitelink extension reports are more detailed and precise. Google AdWords Advertisers now have the ability to manage and track individual sitelinks, rather than only being able to view combined data for all sitelinks. AdWords Call Extensions now include an option to count phone calls as a conversion if the calls exceed a certain length. This allows advertisers to compare the value of call conversions to more traditional conversion types. These added features offer a much more granular view of AdWords ad extensions and their performance, allowing advertisers to optimize extensions better and make sure their extensions are effective in regard to ROI. The addition of these features highlighted the growing importance of ad extensions, and it appears that this trend will persist as Google AdWords continues to evolve. Near the end of 2013, Google announced that they had updated their Ad Rank formula, which they use to determine the positions of different ads on the page following each search. Previously, Ad Rank was calculated using a keyword’s Max CPC and Quality score. Ad Rank now also considers a third factor when determining ad position: the expected impact of ad extensions and formats. According to Google, they now “consider such factors as the relevance, click-through rates, and prominence of ad extensions” when calculating Ad Rank. How will this impact your PPC advertising on Google? If you are using a certain keyword, and one of your competitors is also advertising on that keyword with the same bid and the same quality score, Google will prioritize the ad with ad extensions. Therefore, something as simple as the addition of a call extension or sitelink extensions can give you a distinct advantage over your competitors in the ad auction without the need to bid higher. This can help improve ad position, which often increases click-through rates and helps generate more traffic and conversions, without the risk of accruing any additional, unnecessary cost. Ad extensions have always been an important feature since they were introduced, and they can certainly improve PPC performance and ROI. With the upgraded Google AdWords ad extensions that were rolled out last year, as well as the announcement of the new Ad Rank formula, it appears that Google will continue to place more and more emphasis on ad extensions moving forward. 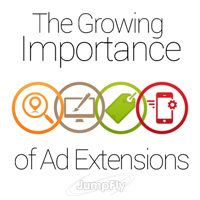 If you aren’t using extensions in your ads already, it might be the time to take a closer look at the added benefits they can offer your PPC advertising.